Reprint. "In association with Obscurus Books, 18a Diagon Alley, London.". Originally published: 2001. A brand new edition of this essential companion to the Harry Potter stories, with a new foreword from J.K.
Rowling, an irresistible new jacket by Jonny Duddle, illustrations by Tomislav Tomic and six new beasts! 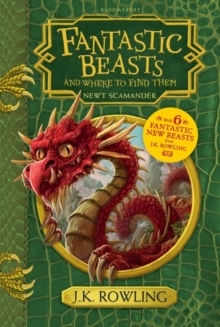 An approved textbook at Hogwarts School of Witchcraft and Wizardry since publication, Newt Scamander's masterpiece has entertained wizarding families through the generations. In this comprehensively updated edition, eagle-eyed readers will spot a number of new beasts and an intriguing new author's note. Scamander's years of travel and research have created a tome of unparalleled importance. Others will surprise even the most ardent amateur Magizoologist.